Update vs. New. This is one of the Settings parameters of A5Doc, and by default it is set to New. New means that each time A5Doc is run, all previously stored documentation is erased, and replaced by the new documentation. To get the most bang for the buck, set this value to Update when documenting from multiple tabs on the main menu. Now, when documenting ,for example, field rules, then any previous field rule documentation is replaced with new field rule documentation. 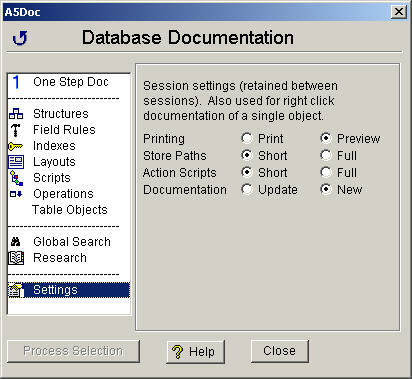 Other types of existing documentation, such as scripts, are retained. If One Step Doc is used, this parameter has no effect since all types of documentation are newly created in one pass.